Ever wonder what happened to the Fresh & Easy brand of food stores? I remember how excited my wife and I were when one was going to open a mile or so from my house. We drove by the store every day and anticipated the store’s opening with great anticipation. The UK conglomerate Tesco’s US offering was right up our alley: Lots of fresh and prepared foods in an easy to shop environment with quick, self-checkout—think much smaller than your typical, massive US grocery store. Unfortunately, the store near our house never stood a chance and closed before ever really opening. If you don’t know Tesco, it’s a UK-based retailer with a history going back before World War II. Today, it’s the third largest retailer in the world by revenue and operates just over 6,000 stores across 12 countries. In 2007 it entered the US market. But just six years later, it closed all of its 208 Fresh & Easy stores and left the US, racking up huge losses. What happened to Tesco’s Fresh & Easy is an object lesson for any brand, large or small. Here’s the story. After deciding to enter the US market in 2006, Tesco did the sensible thing and conducted market research on American grocery shopping habits. The company sent over executives and hired anthropologists to embed with typical Americans in the chosen pilot markets of Arizona, California and Nevada. Surprisingly, despite this ethnographic research, the concept for Fresh & Easy ended up not aligning with the shopping behaviors and preferences of American consumers. Americans, unlike most Europeans, don’t shop daily for different product categories in different stores. Rather, they shop for food on a weekly schedule in bulk at supermarkets that carry lots of product categories and multiple brands within each. Fresh & Easy was a limited-offering store at around one-fifth the square footage of an American supermarket with a high concentration of offerings under their own private label brand. Also, Fresh & Easy was a purveyor of many freshly prepared and ready-to-serve meals, an offering that, a-priori, was better suited to a harried Londoner walking and/or taking the tube home from work to prepare a meal than it fit with a household in Los Angeles, Phoenix or Las Vegas; Americans are more likely to cook their meal from scratch, go out or get take-out. How this gap between Fresh & Easy and Americans’ natural behaviors persisted after in-depth market research is hard to explain. Moreover, on the face of it, the Fresh & Easy concept was more appropriate for the inner-city where there is significant foot traffic. However, many of the Fresh & Easy stores—the one near my house included—were located in areas of lower density requiring driving. If you are going to drive to the grocery store, why visit one with a limited selection that you need to visit more often versus a full supermarket with a wide selection you can visit fewer times? Some of the Fresh & Easy locations were also located on the “wrong” side of the highway (i.e., on the in-bound side of the commute rather than the homeward-bound side). Behavioral economics tells us, if it’s not convenient, people won’t do it. Other stores still were in more working-class neighborhoods, even though the concept was aimed more at upper middle-class consumers. Also, Americans are used to selecting their fresh fruits and vegetables and putting them in plastic themselves. Fresh & Easy pre-bundled fresh fruit and vegetables in plastic wrap where consumers could not get as good a feel for their ripeness. Americans are also used to ordering sandwiches and the like on demand at a deli counter where they can specify the details to their individual liking (e.g., “no mayo, extra pickles, hold the tomato”). At Fresh & Easy, sandwiches were premade and, you guessed it, plastic-wrapped. How did Tesco’s research not identify these issues? If anything, Tesco is recognized as a data-driven organization. One is left to conclude that the US market research was flawed in some serious way, that they knowingly dismissed behavioral differences among American consumers for the sake of being different in the market, that Tesco’s reliance on their worldwide data on consumer behaviors over-rode any preferences shown by American consumers, or some combination of these. The final blow was timing. More specifically, the “great recession” of 2008 and the years that followed. To Tesco’s credit, the experienced retailer’s US operations continued to tweak the stores and were on a path toward profitability when the clock ran down. Tesco leadership, probably at the urging of investors, sacked the US experiment in 2013 to stop any further bleeding. 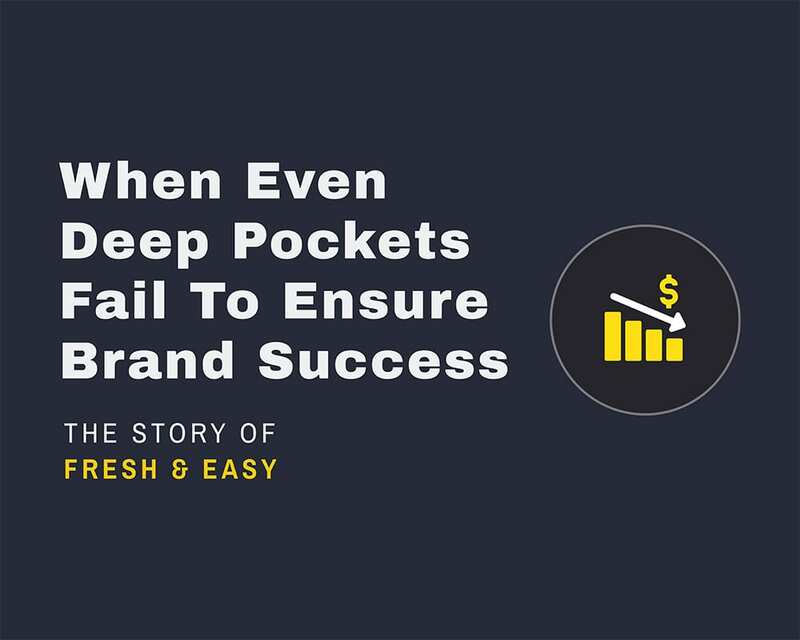 According to some estimates, Fresh & Easy was a mere 18 months from turning profitable. All told, the failed brand experiment cost Tesco nearly $2 billion dollars. So, what’s the core lesson here? No matter how successful you are at something, entering another market needs to be done based on sound research and unclouded by preconceived notions or success elsewhere. Consumers have more options today than ever before; they certainly have far more branded options than they need. Being different is necessary, but not sufficient for brand success. You also have to be highly relevant to your target audience—which includes being appealing/desirable, affordable, available and convenient.